See the influence of push notifications on in-app actions. Adobe Analytics provides behavioral analytics and content performance measurement for websites and mobile apps. Airship Connect provides a live view into your application, adding the “messaging perspective” to your Adobe Analytics information. This integration enables a complete view of the user experience by combining Adobe Analytics data with user-specific interactions such as push sends, direct and indirect opens, and uninstalls. Send Events: A device was sent a notification. Includes the push ID and the user that push ID was sent to. Control Events: A device, targeted as part of an A/B Test, was sorted into the control group. It received no notification, helping you answer the question: "What would have happened had you not sent a notification?" Direct and Indirect Opens: Opens that were either caused by a notification, or which occurred within 12 hours of a notification. In-App Message Events: Displays, resolutions (timeout or user action), expiration. Message Center Events: Delivery, read, deleted. Uninstall Events: The user uninstalled the application. You can also export users from Adobe Analytics and send messages to them in Airship. In addition, we augment Adobe's device reporting with information on in-app behavior defined by the Airship SDK. In particular, we provide information pertaining to our Message Center and In-App Messaging products. We can tell you when a Message Center message was delivered (which happens via a different mechanism than the push notification), read, and deleted. We can also describe what happened to an in-app notification: whether it was displayed or expired before it could be, and what happened to it after it was displayed—did the user dismiss it, interact with it, or allow it to resolve itself? Fetch the Adobe Analytics visitor ID for your user, then associate it with the Airship channel ID. See ID Matching for details about this feature. Under the Connections heading, click Adobe Analytics. 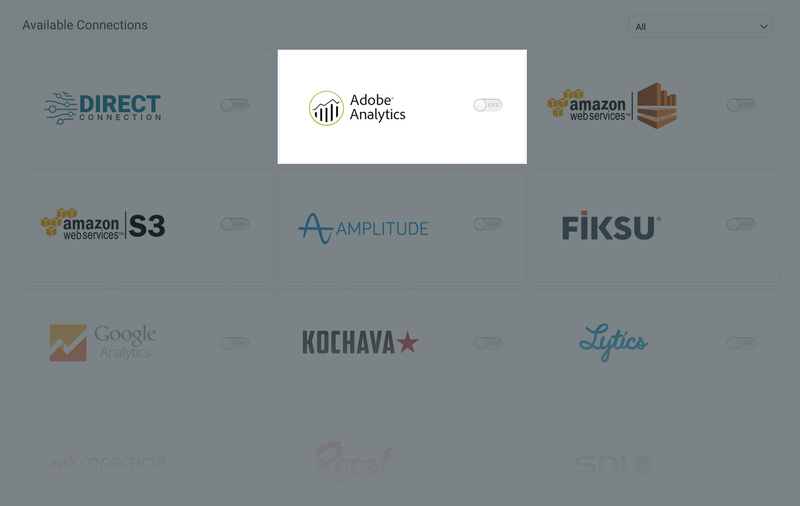 Enter your Adobe Analytics Report Suite ID and Tracking Server URL. If you do not have these, contact your iOS or Android developer. Make sure to include http:// in the URL, e.g., http://namespace.112.2o7.net/b/ss//6. Now that you have configured your app and your Connect integration, you can create event-based Segments in Adobe Analytics. See Recommended Attribute Mapping for recommended mapping of Connect events to Adobe Analytics events. Capture what data is valuable to you by using Adobe Analytics context data and processing rules. Airship uses the Data Insertion API to send data to Adobe Analytics. Airship uses the contextData field so that we can include every piece of relevant data without taking up the limited number of variables and properties Adobe Analytics supports. In Adobe Analytics you can set processing rules so that every field on a Connect event maps to an Adobe Analytics concept. Once your Adobe Analytics administrator has set up the processing rules, you can view Airship connect data in your Adobe Analytics dashboard. This field would be available for mapping as body.triggering_push.push_id. When mapped to a variable (sProp, eVar, event, or other Adobe Analytics concept), the variable’s value would be d99bd842-f816-4560-bc59-b057f7c0e164. The above JSON example is a partial object. Actual JSON objects coming from Connect are much more complex. To see all the available fields, read the Connect API Reference. Other Connect information Varies You can determine what the context variable name will be based on the Connect data. Inner properties are joined with outer properties via a period. contextData can take a long time to appear in the Adobe Analytics dashboard. Please allow at least one hour before contacting Airship Support. Known issue: If no processing rules have been defined, no contextData variables will be available for Mapping. As a workaround until Adobe Analytics fixes this issue, add a trivial rule that does nothing, then proceed establishing your mapping as normal.